Spitsbergen — an island under Norway’s jurisdiction — is home to the world’s northernmost city, church, hotel, newspaper, museum, blues festival, car dealership, Oktoberfest and marathon, just to name a few of the many geographic distinctions it proudly trumpets. At 15,251 square miles, about the same size as Ireland, Spitsbergen is the largest island in the ruggedly beautiful and unspoiled archipelago of Svalbard, 500 miles east of northern Greenland in the Arctic Sea. 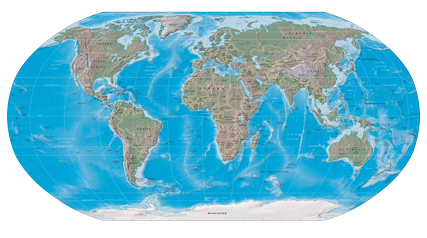 Svalbard’s northern tip, at a latitude that reaches beyond the 80th parallel, is only about 600 miles from the North Pole. That’s roughly the same distance between Phoenix and Denver. In other words, if you want to venture north for the summer, this is about as far north as you can go. I recently spent a week in Spitsbergen as part of a land-sea expedition booked through Hurtigruten, a Norwegian-based cruise line that specializes in expeditions to Norway, the Arctic and Antarctica. My trip began with three days in Longyearbyen, the administrative capital of Svalbard, which is loosely governed by Norway. The city was founded by American entrepreneur John Munro Longyear, who established a coal-mining operation here in 1906. Its economy still is fueled by coal mining and boosted by a budding tourism industry. About 2,000 people live in Longyearbyen in bright, pastel-colored homes overlooking a fjord, giving it the distinction of being the world’s northernmost city (with “city” being defined by having a year-round population of at least 1,000). 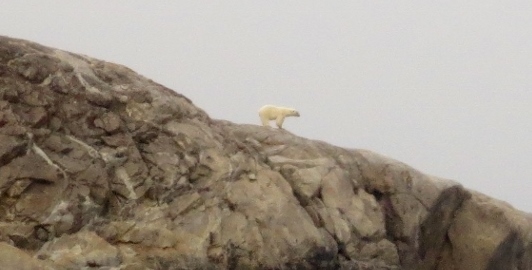 Leave the city limits and a sign warns visitors of the perils of polar bears. Even though polar bear attacks on Spitsbergen are extremely rare, visitors who venture out of Longyearbyen are required by law to either carry a firearm or be with someone who is. So if you’re a tour guide on Spitsbergen, in addition to carrying maps, water and a cellphone, you better be packing heat. Even the driver of a large bus I boarded for a two-hour city tour of Longyearbyen — a white-bearded Norwegian named Wiggo — was toting a high-powered rifle. After three days of sightseeing in Longyearbyen, including a popular “dogsled on wheels” trip along the city’s harbor and a boat trip to an abandoned Russian mining town called Pyramiden, I boarded the M.S. Nordstjernen (“North Star” in Norwegian) for a four-day cruise around the archipelago. The Nordstjernen, chartered by Hurtigruten for summer excursions in the Arctic, the Nordstjernen has been sailing since 1956. 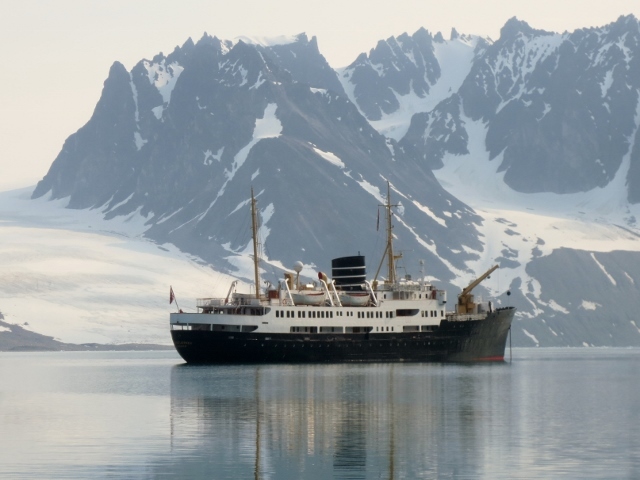 Its cabins are small and it lacks many of the amenities found on newer and larger cruise ships – no TV, Internet access or nightly entertainment – but the classic old-school steamer is perfectly suited for Spitsbergen’s icy waters and rugged landscape. Indeed, a huge luxury liner would seem as out of place in Spitsbergen as a saguaro cactus. 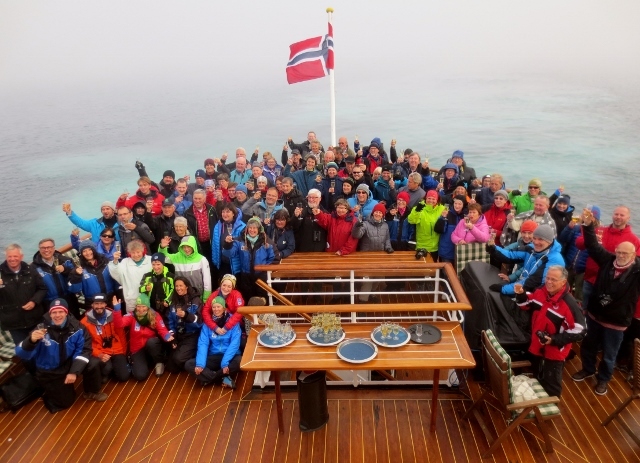 The Nordstjernen can accommodate 108 passengers – excluding the crew — and was 80 percent full on my sailing. About half of the passengers were Norwegians; there also was a large contingent of Germans. I was one of only four Americans aboard. During the trip, we also observed beluga whales, Arctic foxes, reindeer, walruses, a wide variety of birdlife and some surprisingly diverse and colorful Arctic flowers. 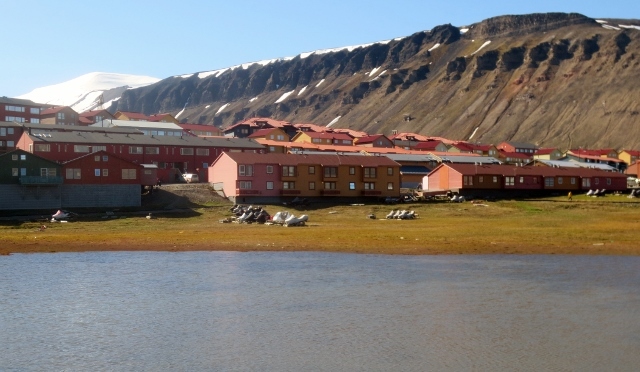 Despite its northerly location, Svalbard has a relatively mild climate. Thanks to the northern branch of the warm Gulf Stream, the island’s western coast, where we sailed, is the world’s most northerly ice-free area. 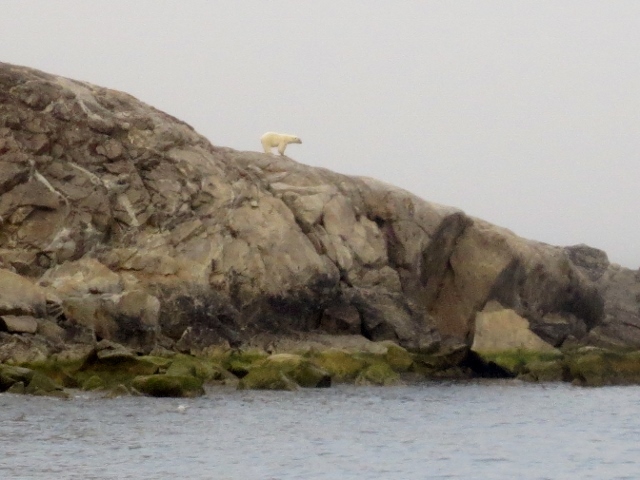 Temperatures were in the 40s; one day was so mild that about a dozen of the Nordstjernen’s hardiest passengers went swimming in 40-degree water in a bay following a nature hike. 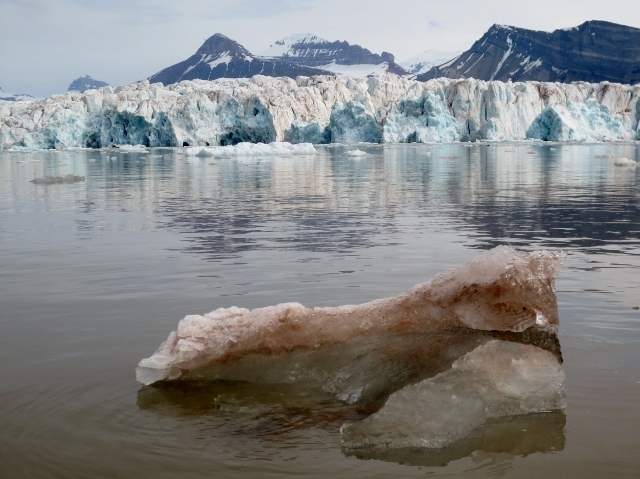 About 60 percent of Spitsbergen is covered by glaciers. We got a breathtaking look at the Kronebreen Glacier, when the ship’s tenders took us within about 300 yards of the massive blue and white-colored ice (to see a video clip of the glacier, click on this link: Kronebreen Glacier.) We were not allowed to sail closer due to the constant threat of summertime calving. One of the Nordstjernen’s guides just completed her master’s degree in glaciology at a university in Longyearbyen. Her thesis about how much the Kronebreen has receded in recent years was the topic of one of several fascinating lectures presented during the cruise. On a foggy Sunday night, we passed the 80th parallel, one of the few places on Earth where you can sail in open water at that latitude. The captain commemorated the occasion by honking the ship’s horn and the passengers celebrated with a champagne toast. Through the fog, we got a brief glimpse of a small island of Moffen, populated by a colony of walruses. Our final stop was in Ny-Alesund, an Arctic research base on Spitsbergen that hosts scientists from 10 countries. It is the northernmost non-military settlement in the world. Ny-Alesund also features the world’s most northerly hotel – the Nordpol Hotellet (North Pole Hotel). But you won’t find it on Hotels.com. The hotel is reserved for friends and family of the town’s residents. Only 35 people live in this settlement year-round, although that number can swell to more than 100 during the summer. 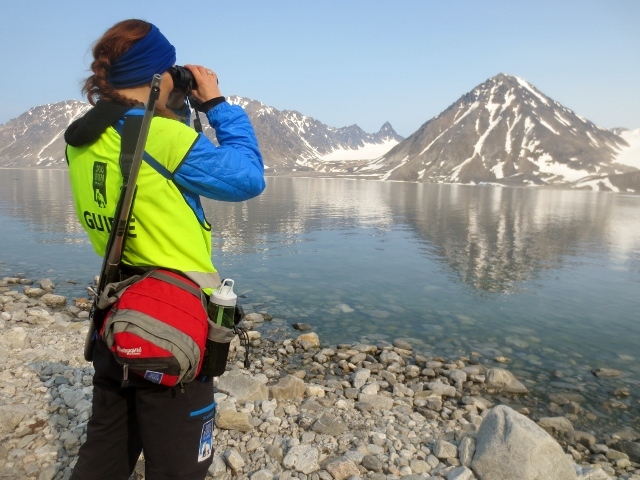 Tourism in Spitsbergen is growing but remains relatively low due to its remote Arctic location and high prices for hotels, restaurants and tours. About 50,000 tourists visit each year, half of whom arrive on cruise ships. Other than cruising, the only way to reach the island is via flights from the Norwegian mainland. But once you get there, you’ll experience a unique summertime escape from the Arizona heat. You’ll enjoy spotting and photographing wildlife – including a rare chance to see polar bears in their natural habitat — and gazing at pristine scenery in a place where you won’t have to rub elbows with a lot of fellow tourists. And you’ll do it all near the top of the world.